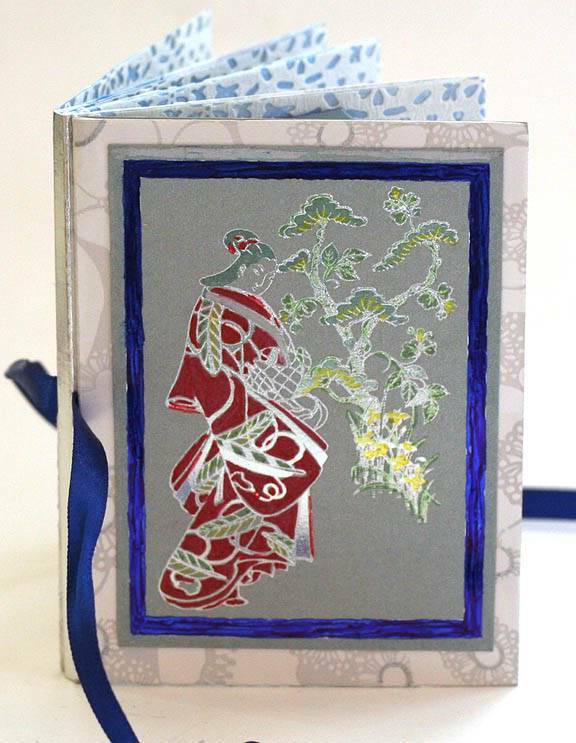 Like the subtle colouring of this and how the filigree pattern happened to come at the top of the pages. That's different, the blue on the front is glowing, how is that done? Another lovely book - beautifully done Nona. lyndaejane wrote: Like the subtle colouring of this and how the filigree pattern happened to come at the top of the pages. Ha ha Lynda, I cheated with the filigree, it didn't. & match pattern, then glued it to the top of the pages. Thrifty, it was a bought sheet of oriental bits and pieces that had just grey and shiny silver images on. So, I coloured it in with ProMarkers. Not easy as it was so tiny. It is the first time I have used a bought image so I had to alter it ! 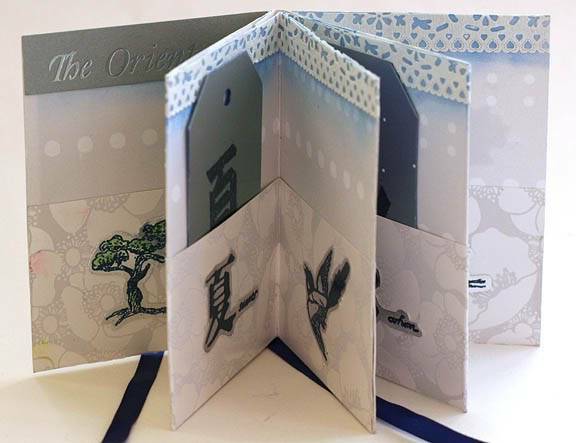 All the 4 Tags each have a Japanese symbal for the season on them, likewise the pages also. Lovely book Nona and interesting explanation of everything. what a Beaut, I did see some of the bits but not finished, it looks super x wonder who got this one? I don't know who got it Goaty. Oh Dear I was sure I replied to this thread Nona, ages ago, and my message isnt here! Thank you so much, and sorry my post didnt appear!!! So glad you got it Mrs Shorty. What a nuicance about lost posts. Thanks for telling me goaty.